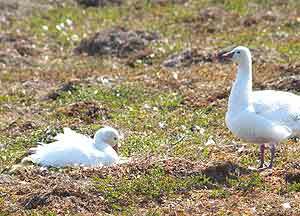 Male and female Snow geese. Following many weeks of bitterly cold north winds, at last a southern wind came, bringing with it the first pairs of geese. Slowly the numbers increased until thousands of these noisy summer migrants were arriving at Karrak lake solely for the purpose of breeding. Our job now was to select and shoot approximately 50 females from each species for dissection. These females were used to provide an estimate of their physical condition and reproductive status. The first geese to arrive were not in prime condition and predators took advantage of these individuals. On one occasion a hungry dog fox managed to display its opportunistic nature by frantically trying to steal our prey. Desperately racing across the open tundra we eventually recovered the goose but kept many memories of our close encounter with an arctic fox. With the constant stream of geese arriving, the arctic silence was broken by the persistent sound of gaggling geese. By the time the snow had almost completely gone the landscape still appeared white with much of the land in the colony being occupied. Much to our delight a wolverine boldly ran past the camp one day causing great excitement and interest. Regrettably time spent finding one’s camera meant that the best opportunity was missed and after a while it became apparent that occasionally it was worth forgetting about technology and appreciating the moment for what it is. Summer Solstice was here! We therefore felt an arctic party was required. With the little music from the hi-fi and drinking whatever was in camp we celebrated the first day of summer. It was an amazing experience to be up in the early hours of the morning still with the constant daylight and watching the sun touching the horizon just for a moment and then rising up again with the continuous sound of geese in the background. With all the geese now here, data collection and field times significantly increased and we searched for goose eggs 12 hours a day, or longer. Every day groups of two people equipped with maps, GPS, radios, bear bangers and later in the season mosquito spray, went out to examine the density of nests and the amount of eggs following a strict protocol. The eggs were labelled so that in several weeks time their rate of success could be recorded to previous years. Having packed all the equipment we required like tents, food, a satellite phone, notepads and a shotgun we were ready to leave. Only able to carry our loads in a bent-over position, we started on a sunny day happy to leave the camp behind for a couple of days.To reach distant parts of the colony it was necessary to organize a group to camp in the outer regions that were too far away from the main camp for a single day trip. At the beginning of July six of us set out to explore the edges in the north, south and west of the colony. Reaching our selected “camp-site” was already more difficult than expected due to the snow melt. Small streams on the map now took the shape of larger, deeper and stronger flowing rivers. With little choice we were forced to cross several of these rivers leaving us with sodden waders and wet underwear. But in the evenings when we sat on a cliff gazing at the distant horizon while eating pasta with tinned beans almost all the hardships were forgotten. Upon the arrival back into camp the simple amenities throughout camp suddenly appeared as luxurious qualities. With the warm welcome we received for our effort we had a day of rest and relaxation. With the ice becoming too soft to walk on, we had to use boats in order to leave our island. During the beginning of the summer large chunks of ice lay on the lake and it was necessary to push and pull the boats through or over it. The loud crushing noises leave you wondering how much those boats can endure. There was no boat without a leak and therefore bailing became a regular activity. 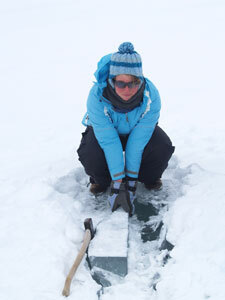 A great deal of strength was required in order to pull oneself back into the boat after hauling it through the thick ice. This reminded us of early explorers hauling heavily laden sledges great distances across the ice. We just hoped that the extra large bright yellow float coat we wore would do its job. On a special occasion Mungla had the opportunity to test its efficiency. While trying to get the boat through solid ice, she leapt out, pushed from behind and suddenly as the boat surged forward it left her standing alone on the ice floe. At the moment she lost touch with the boat, she knew it was going to be a wet experience. Moments later the ice cracked and she sank into the lake. The float coat successfully kept her head above water but the rest of her body was submerged in 4 degree water and floating ice. With the help of a colleague she made it back into the boat. The earlier months reflected the transition from the harsh Arctic winter to a far milder summer climate. 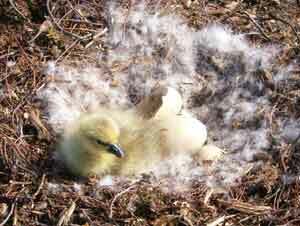 Immediately eggs were laid, pups were born and young tender plant shoots thrust upwards and the arctic landscape was transformed. Everything seemed alive and the noise of the colony was deafening. Thousands of geese and other bird species like the Glaucous gull, Arctic tern and the Long-tailed duck breed at Karrak Lake as do predators like the Arctic fox and Wolverine. By mid July these new arrivals are all undergoing their first steps of life exploring this dangerous world struggling for survival the minute they are born. Not all animals come up here for breeding. For example the Grizzly bear only makes his way into the colony to exploit the seemingly endless food resources. We had several bear sightings and encounters as well as the obvious adrenaline rush and use of bear bangers. 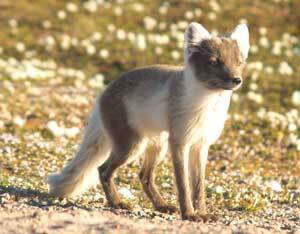 The first Arctic fox cub. 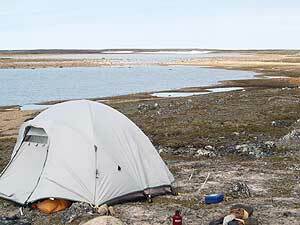 In such an open environment one felt that one would always see a bear at 400 metres. Often those ‘bears’ turned out to be rocks, but on one occasion we were taken by surprise to suddenly see a mother and two yearlings at barely 70 metres. Fortunately they seemed not too bothered by our presence and after a while the small family continued searching for food clearly undisturbed by us. 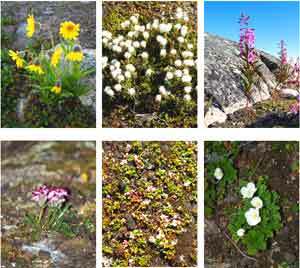 The flowers at this time of the year provide a wide variety of color to the tundra giving it a sense of new life. The once barren landscape blossoms with vibrant colors displaying an array of multi-colored carpets and stunning scenery for the duration of this short growing season. Erratic weather is something you get used to living in the arctic and when a heavy thunderstorm emerged out of the blue this was no exception. On this particular occasion torrential rain was driving into the cabin breaking the door while causing leaks in the roof of the equipment cabin. Later we found that this storm, having lasted a mere four minutes, had swept our boat across the lake. Waiting for the other boats to return home so we could fetch the stray, we just hoped the wind and rocks would not inflict damage upon our boat. 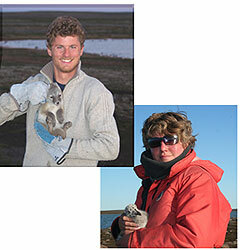 During the later part of the field season King Eider ducks and Arctic fox pups were captured. Female king Eider ducks and their ducklings were banded by gently placing a net over them as they sat on their nest. Fox pups where trapped then fitted with ear tags near their dens. 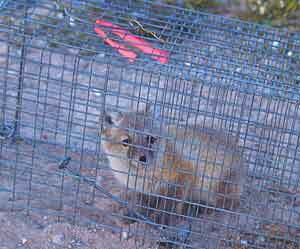 While awaiting the pups reappearance following the setting of the traps, our excitement was intense. Then they appeared inching closer to the bait leaving us entranced in this gripping action movie. Then ‘Bang’ the door closed and the pup was trapped! We hurried over to the trap and there was our first pup. Admiring its silvery-grey summer coat, we picked it up and cherished this moment. Throughout this time we were constantly pestered by mosquitoes. Strong insect repellents in addition to mosquito jackets and nets made us look and smell as though we were from a different planet. When late July came, Karrak Lake was returning to its seemingly lifeless appearance. As other bird species prepare to leave for their winter feeding grounds, Snow and Ross geese move north to the coast with their goslings in order to feed and complete their moult before the southward migration. With geese being unable to fly during this time a helicopter was hired to select suitable groups of geese for leg banding. While the helicopter rounded up the geese, we hastily pegged out the corral into which they would be driven. In the chaos of flying feathers more than 10,000 birds were banded by the end of the summer. Edward Moss was born in London, United Kingdom and obtained his MSc in 'Wildlife Biology and Conservation' during 2005-2006 while studying the Red fox and Arctic fox on the Swedish mountain tundra. Whilst being a keen amateur photographer, his fascination for the tundra environment continued as he became involved with the International Polar Year 2007-2009 and as a result he now sits on the Council for the Association of Polar Early Career Scientists (APECS). Mungla Sieck was born in Berlin, Germany in 1982. She obtained her MSc in 'Wildlife Biology and Conservation' in Edinburgh during 2005-2006 while studying the population dynamics of wolves in Italy. Loving large predators and seeing the problems arising with these species she is now preparing a PhD on lynx in Norway.